Highlights harmful bacterial plaque on teeth and shows where more brushing and flossing are needed. 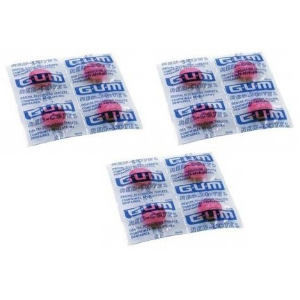 Cherry flavor tablets - each 12 ct. ships as three four count packages. Directions: Brush teeth and rinse mouth. Chew 1 tablet. Swish around the mouth for 30 seconds. DO NOT SWALLOW. Expel/spit. Rinse with water. The red color remaining on teeth indicates areas overlooked in brushing and may contain harmful dental plaque. Thoroughly remove the dark red color by brushing and flossing. Use periodically to monitor plaque.